We live in an instant world. So why wait for perfectly chilled, sparkling or boiling water? GROHE Watersystems with GROHE Blue and GROHE Red deliver perfect taste and 100 °C straight from the tap: “Water reinvented”. Perfect taste straight from the tap with unbottled water by Grohe Blue Home and 100°C straight from the tap with boiling hot water on demand by GROHE Red. 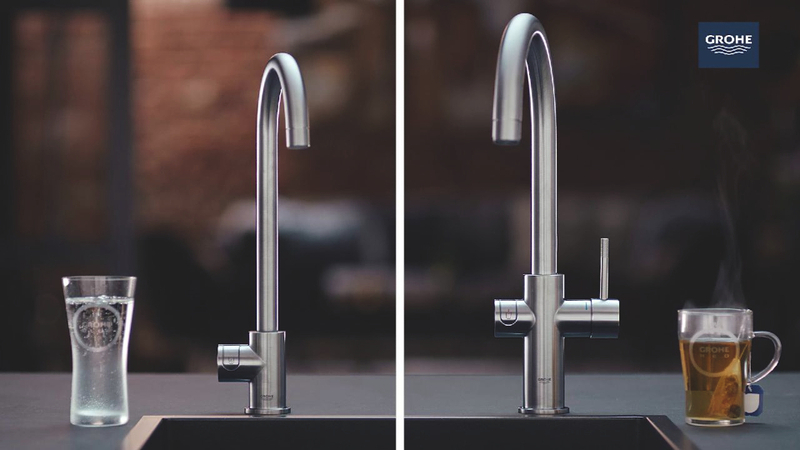 GROHE Watersystems are designed to look beautiful in your kitchen. Choose here which combination fits perfectly your needs. Answer a few simple questions and find the GROHE Watersystem that fits perfectly your needs and get perfectly chilled, sparkling or boiling water in an instant. Welcome to your private water source. Introducing boiling hot water on demand.